New Phone Directories are now available in the Amen corner or contact the office. The cost of printing was $2.50, so donations would be appreciated. Please note on the front cover the website address should read immanuelunitedchurch.net . Annual Reports are due by Tuesday, April 24th. Please email them to iuchurch or bring in to the office. Golspie Club meets this Thursday, April 12th at 1:00pm. All seniors are welcome! Sunday School Parents please see our website for important dates. Go to immanuelunitedchurch.net, click on Worship Life at the top and then click on Sunday School. Just a Reminder that all Sunday School children are invited to stay after church on Sunday, April 15th to help Donald Stewart celebrate his birthday (no gifts, please). Call Jane at 233-8756 if you need more details. The Immanuel Outreach Committee has designated the third Sunday of every month as “Stella Sunday”, and receive donations of food for Stella’s Sunday afternoon programming. Donations of high protein canned meats and beans, cheez whiz, jams, peanut butter, crackers, juice boxes, baby food, baby supplies and also cookies and buns would be greatly appreciated. The Outreach Committee will make sure these items get to Northend Stella. The next “Stella Sunday” is April 15th. Please help out if you can. Movie Group #2 would welcome some new members. We have lots of fun. Enquire from Doug McMurtry. Annual General Meeting will take place on Wednesday, May 16th at 7pm. Please plan to attend. Immanuel Players Presents its annual Dessert Theatre, “A Night in the Theatre” a play by Lawrence Casler. The dates are Thursday, April 19th, Friday, April 20th and Saturday, April 21st at 8pm. Tickets are $12.00 each and can be purchased after Worship or contact Sharon in the office. Dessert Theatre Volunteers Needed to provide hospitality to our guests. We need desserts, help to serve, set up and clean up. We also need money to purchase fruit, which can be marked as “Dessert Theatre Donation” on your offering envelope or give directly to Cathy Haining or the church office. Please see sign up sheets in the AMEN corner. The Visioning Committee has been meeting with various groups from the congregation as we continue the Visioning conversations. We are hoping to give everyone an opportunity to participate. The intention is to understand; Who are we as a Congregation? Who we are called to be? We held one session on Wednesday, March 7th and another session after worship on Sunday, March 11th. The next general session is scheduled for Sunday, April 15th after worship, a light lunch will be provided. All are welcome so please come out and share your thoughts. We would appreciate it if you would sign up on the sheet posted in the AMEN corner. If you have any questions please contact a member of the Visioning Committee…Bill Hickerson, Marg Smith, Karen Turk, Ian Donnelly or Lynda Endicott. Names Instead of Numbers The Remembrance Book Project for the Prisoners of Dachau Concentration Camp is on now at Westminster United Church, 745 Westminster Avenue (Chapel) until April 15th. Hours open are Monday to Friday 10am to 7pm and Saturday and Sunday from 10am to 3pm. Annual Eco-friendly Dinner will be held on Thursday, April 19th, 2012, 7:30pm at Sturgeon Creek United Church, 207 Thompson Drive, sponsored by Project Peacemakers. A delicious vegetarian buffet, entertainment, silent auction, speaker for Earth Day. Tickets are $15.00. Call the Peace Office at 975-8198 or see Doug McMurtry. 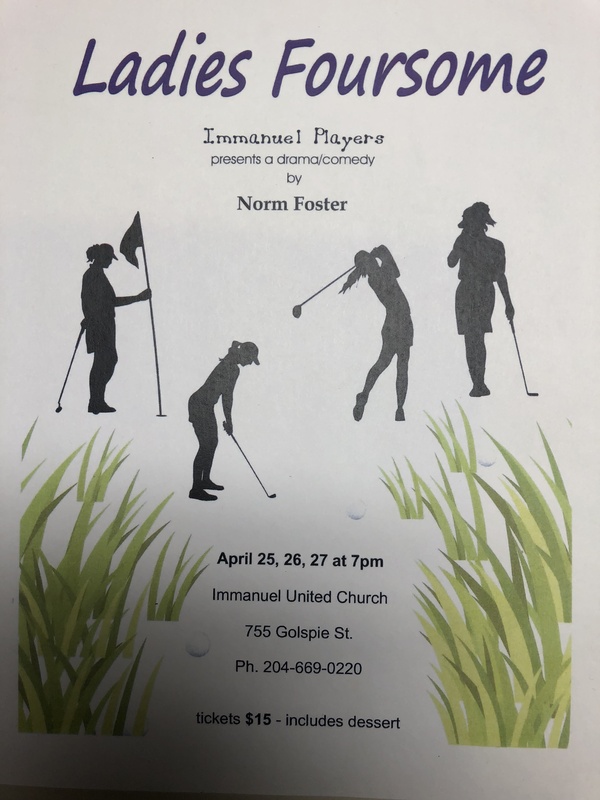 This event is on one of the evenings of the Immanuel play, but it is hoped that at least a few Immanuel people can arrange to go. The 170 & 176 Band Concert 70th Anniversary Celebration at Knox United Church, May 5th at 2pm. Tickets are $5.00 each, please call 256-9772. This is a fundraiser for the Military Families’ Fund and Food Bank. Donations accepted for the Food Bank! Our website is immanuelunitedchurch.net Check regularly for updates! Remember our Red River Co-op gas number is 193228. I will be in the office on Tuesday, Wednesday and Thursday mornings this week.